ISLAMABAD: Chief Justice of Pakistan (CJP) Mian Saqib Nisar on Monday suggested the formation of a Panama Papers-style joint investigation team (JIT) to probe the allegations against former president and PPP Co-Chairman Asif Ali Zardari and his sister Faryal Talpur in a case pertaining to money laundering of at least Rs 35 billion through fake or ‘benami’ bank accounts. A three-member bench resumed hearing the suo motu case in the Supreme Court regarding the investigation into the alleged fake bank accounts and fictitious transactions conducted through several mainstream banks via ‘Benami’ accounts. The bench summoned the Omni Group of Companies owner and former president Asif Ali Zardari’s close aide Anwar Majeed along with his family in the same case on August 13. 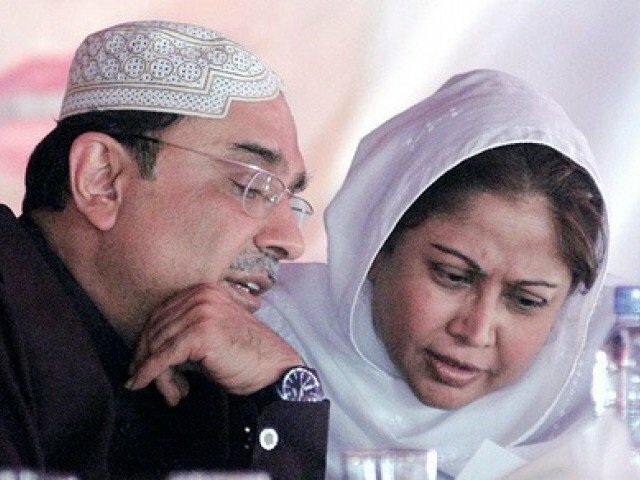 Moreover, Asif Ali Zardari and Faryal Talpur are the prime suspects in the case who were summoned on more than one occasion in the court. Talpur’s counsel Farooq H Naik told the court that “a lot of people were being defamed by being named in the probe by the Federal Investigation Agency (FIA), and asked the bench to stop the publicity surrounding the case”. Moreover, Justice Nisar said that “the court would not have supported the FIA probe if the agency was accusing people wrongly”. Justice Umar Ata Bandial in his remarks stated that the amount present in the ‘fake’ accounts was black money and had been acquired through theft. “If money laundering was proven then the court would not spare anyone,” the chief justice remarked, adding that if it’s the case otherwise, “the court would issue a certificate of honesty to your client”. Earlier on Monday, FIA submitted a report in the same case to the apex court, where FIA Director General Bashir Memon said, “More than 10 political personalities are allegedly involved in fictitious transactions through fake accounts,” adding that “the amount possibly laundered exceeded Rs35 billion as 10,000 dubious transactions were discovered during investigations”. “Asif Ali Zardari and Faryal Talpur were summoned on more than one occasion but failed to appear before the investigation team,” he said. In addition to that, FIA requested the apex court to constitute a high-power JIT to probe alleged money laundering of Rs35 billion through fake accounts. Furthermore, Justice Nisar asked for the formation of a JIT, defence counsel Aitzaz Ahsan raised objections. Responding to Ahsan’s query if the trial will be heard by the top court or a lower court, the chief justice said, “The trial can be conducted in SC as well.” Justice Nisar added the JIT would be formed in a similar fashion to the one formed the in the Nawaz Sharif case as a “balancing act”. The CJP also hinted at forming a special court to hear and sought result in a month. On July 30, Talpur had challenged FIA’s interim charge sheet and submitted Rs2 million bail amount in the court. She stated that “money laundering has not been mentioned in the FIR while her role is also not clearly stated in the charge sheet”, thus denying all the accusations levelled against her. The police first investigation report (FIR) stated that M/S Zardari Group (Asif Ali Zardari, Faryal Talpur, etc) got Rs15, 000,000 and were among the beneficiaries of the transaction trail of fake bank accounts maintained by Omni Group. Meanwhile, a former employee of a bank told the court that the police was harassing her and her family in connection with the FIA probe into fake bank accounts. After hearing her allegations, CJP Nisar remarked that “the court will constitute a Joint Investigation Team, similar to the one formed to probe the Panama Leaks case”. The chief justice then ordered Sindh Police Inspector-General Amjad Saleem to submit a report on the harassment incident within two days. The police chief told the court that action would be taken against any police officers found involved in harassing innocent citizens.